Francesco’s gowns and cloaks were the handsomest part of his wardrobe. While quite young men or working-men would not hesitate to appear dressed only in doublet and hose, a man of standing usually wore over them a long gown – generally called a gonnella in Tuscany, but referred to in all Datini lists as a cioppa. At this time the short, tunic-like gonella of France was the fashion among the young, but Francesco, like most older men, preferred the long gonellone, like a lawyer’s or a doctor’s, in which he may be seen in his portraits. In 1397 he had as many as ten of these, of which five were old ones for everyday wear, two had fur linings, one was of dark cloth lined with vermilion, one of cloth lined with green taffeta, and one “old unlined one, for writing”. He also had a gown of dark camlet – a cloth made of goat’s or camel’s hair – lined with pale-blue taffeta, and one “for riding” of grey cloth lined with Sardinian sheepskins. And, finally, there were two very grand gowns for great occasions – one of rosato, the aristocratic colour, with a fur lining of squirrel, and one dyed “in grain”, lined with scarlet taffeta. obervations: Iris Origo, Marchesa of Val d'Orcia, was of Anglo-Irish background, but spent most of her life in Italy, and had considerable expertise in the culture and history of her adopted country. This book is based on a stash of letters and documents relating to a wealthy merchant in the Tuscan town of Prato: they remained hidden in a cupboard for hundreds of years, to be re-discovered in 1870. This was pretty much a unique horde, painting an unparalleled picture of the tiny details of life in his household – letters, accounts, notes, financial documents. She pulled the details together into an account of his life – scholarly and careful and interesting. Nowadays I think people would expect to see more of the whole letters, rather than her narrative account, illustrated by frequent short extracts. But she says that the letters are very repetitive, and would be boring to read in full. She also says that Francesco di Marco Datini wasn’t a particularly nice or popular man. Fur seems to have been much less expensive than cloth. The pelts mentioned in these lists are ermine, miniver, squirrel, dormouse, cat and pelli sardesche (probably Sardinian sheepskins). It’s a sober book, but one that must be of endless use to anyone looking at life in Italy at that time. There’ll be another entry on Francesco’s wife’s clothes. 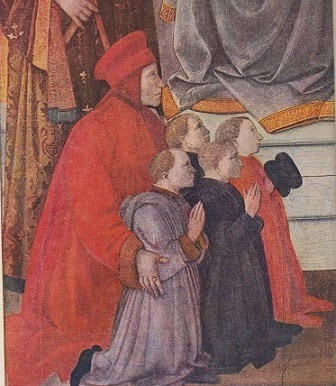 The picture – from the book – is of Francesco di Marco Datini and four men of Prato, by Filippo Lippi. What an interesting-sounding book, Moira! And what a treasure trove those letters and documents were. Those kinds of finds are a real window into the way people lived at a certain time, and I think that's fascinating! Absolutely Margot. It makes me wish I had studied history more. Moira: The style of that day certainly makes the style of today for men look bland. Bold colours and fabrics v. black and occasionally a hint of colour. I think you mentioned once that you had a taste for stylish ties - I think if you'd lived in 1400 you'd have enjoyed a taffeta lined red gown down to your knees. Would look good in court. Hmmmmmm........any around your neighbourhood stores for this Christmas? This is interesting, but I can safely say this is one you can read for me. Definitely one for you not me, and if that's stylish I'm glad to be bland. I bet you'd look good in it. You should be inspired by Bill, who at least is (claiming to be) considering it! Moira, I rarely say this but I don't think this one's for me either, at least for now. I assume the book is written in epistolary format.